After parliamentary elections on March 15th and against a backdrop of political uncertainty, the Dutch economy is holding firm. Business and consumer confidence in the Netherlands have seen an upswing and the outlook for insolvencies shows a 3% decline. However, the impact of Brexit and that of US protectionism remain possible reasons for concern. In 2017, 35% of domestic and foreign B2B sales were made on credit. This means that the Netherlands is fairly open to granting trade credit to B2B customers. On average, 39% of the sales to domestic B2B customers were transacted on credit. Only 31% of foreign B2B sales were made on credit. 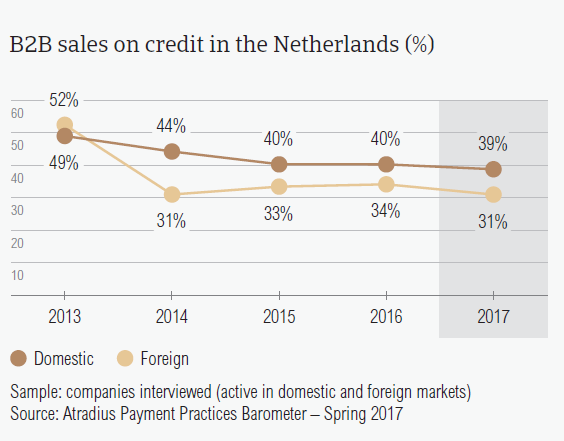 Just like in the other Western European countries surveyed, respondents in the Netherlands were more reluctant to offer credit terms to foreign B2B customers. This may highlight a greater degree of trust when trading with domestic B2B customers. Compared to the 2016 survey results which showed that 36.9% of domestic and 33.9% of foreign B2B sales were made on credit, there has been a reduction in the percentage of both domestic and foreign B2B sales made on credit in the Netherlands. Moreover, the percentage of B2B sales on credit in the Netherlands is below the regional average (38.8%) and almost in line with that of Spain (37.8%). The total value of overdue invoices in the Netherlands (33.7%) increased by almost a percentage point compared to one year ago. However, this is well below the regional average of 41%. Late payments were reported in the Netherlands (92.4%) more frequently than in Western Europe overall (87.8%). 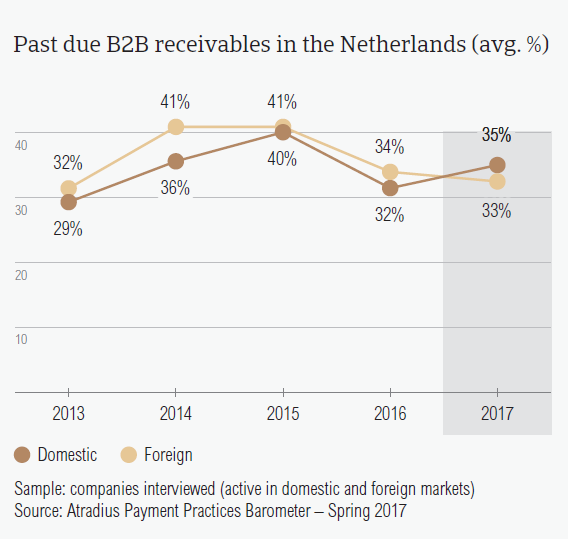 The percentage of overdue B2B invoices reported by suppliers in the Netherlands is also higher than that reported in last year’s survey (88.2%). Almost one third of payments in the Netherlands (33.7%) turned into overdue invoices. This is significantly lower than the Western European average of 41%. In 2017, the Days Sales Outstanding (DSO) figure posted by respondents in the Netherlands averaged 41 days. The average DSO is one day shorter compared to that of 2016 and three days shorter than the regional average. While most respondents in the Netherlands (69.3%) do not anticipate a change in their annual average DSO, a lower percentage of Dutch respondents (13.3%) than in Western Europe overall (19.1%) expect an increase. 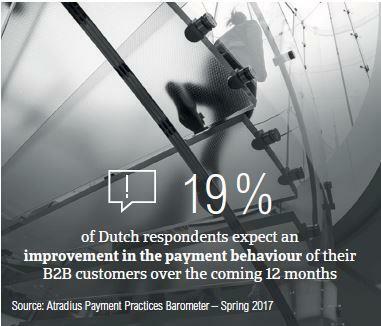 In 2017, respondents in the Netherlands requested faster payment from their domestic and foreign B2B customers. There have been minor changes in average payment delays. In 2017, respondents in the Netherlands asked their B2B customers to pay invoices within 24 days, on average. The average payment terms were three days shorter than the level of 2016 (27 days). More specifically, domestic B2B customers were given, on average, 22 days from the invoice date to settle payments. Foreign B2B customers were given, on average, 26 days. The strong emphasis on swift invoice payment observed in the Netherlands was also seen in Denmark (average payment terms: 24 days), Germany (24 days) and Austria (25 days). Consistent with what was observed at regional level, there was a slowdown in the speed of domestic payment. Domestic B2B customers of respondents in the Netherlands paid invoices, on average, 15 days late (2016: 14 days). 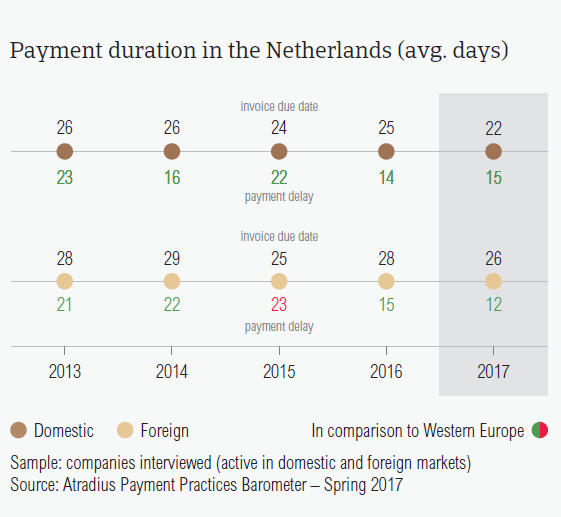 In contrast, foreign B2B customers of respondents in the Netherlands settled their invoices faster, within 12 days past due, on average (2016: 15 days). This means that it takes Dutch respondents, on average, 38 days from invoicing to convert overdue B2B receivables into cash (two days less than in 2016). Respondents in the Netherlands, like in the other Western Europe surveyed, reported that payment delays by domestic and foreign B2B customers were mainly due to liquidity issues, buyers using outstanding invoices as a form of financing and the complexity of the payment procedure. Domestic B2B customers of respondents in the Netherlands delayed payments most often because of liquidity issues (52.8%). This compares to 52.6% of respondents in Western Europe stating the same reason. 39.7% of respondents in the Netherlands said that payments by their foreign B2B customers were delayed because of liquidity constraints. This percentage is slightly higher than that registered in Western Europe overall (34.5%). Other reasons for payment delays stated by Dutch respondents in respect to both domestic and foreign B2B customers were buyers’ use of outstanding invoices as a form of financing (domestic: 35.8%; foreign: 21.5%) and the complexity of the payment procedure (domestic: 18.8%; foreign: 31.1%). 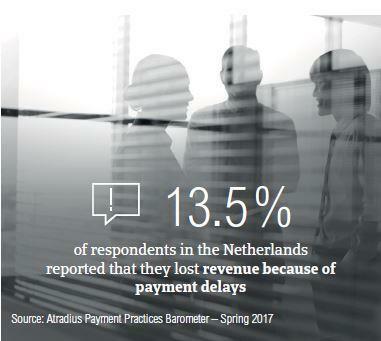 13.5% of respondents in the Netherlands said they lost revenue because of payment delays; 14% said they needed to postpone payments to their own suppliers. Fewer respondents in the Netherlands than in Western Europe said that they will increase protection against the impact of Brexit, the slowdown in Asia and US protectionism. 54.2% of respondents in the Netherlands (Western Europe: 48.3%) reported that they will continue using their current mix of credit management tools to protect their businesses against risks arising from the above mentioned developments. A lower percentage of Dutch respondents, 14.8% compared to 18% for Western Europe overall, said that they will increase their use of credit management tools. When asked about which credit management actions they would take, most respondents in the Netherlands opted for checking their buyers’ creditworthiness (18.8%), monitoring buyers’ credit risk and increasing bad debt reserves (each with 16%). To manage potential risks stemming from Brexit, Dutch respondents said they will increase checks on buyers’ creditworthiness (19.7%), reserve against bad debts and monitor buyers’ credit risk (both 15.9%). 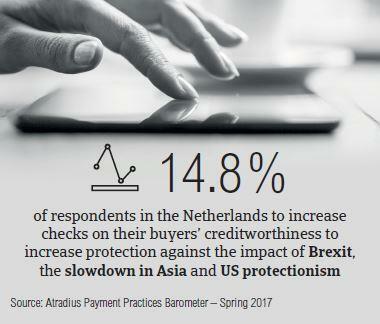 In respect to US protectionism, respondents in the Netherlands plan to do more checks on their buyers’ creditworthiness (21.2%) and increase bad debt reserves (19%). The slowdown in Asia seems to be the least likely to prompt respondents in the Netherlands to increase their use of credit management tools. The proportion of B2B receivables reported by suppliers in the Netherlands as being written off as uncollectable (0.4% of the total value of B2B receivables) is below the average for Western Europe overall (0.6%). Domestic receivables were written off as uncollectable almost three times as often as foreign ones (domestic 0.7%, foreign 0.2%). 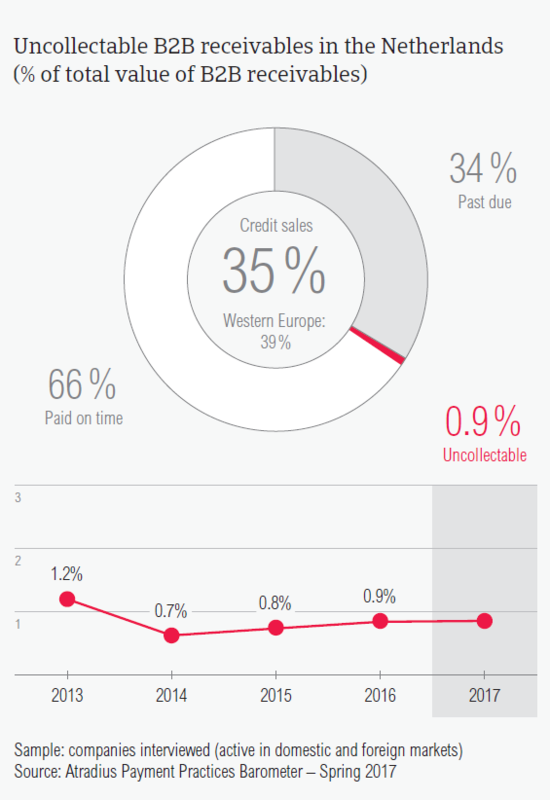 This is slightly less than the percentages of uncollectable receivables in Western Europe overall (domestic 1%, foreign 0.3%). There were no changes compared to the percentages observed in the Netherlands last year. Uncollectable B2B receivables originated most often from the construction, consumer durables, and services sectors. B2B receivables were reported to be uncollectable mainly because the customer went bankrupt (60.4%) or due to the high costs of pursuing debtors (29.6%). Over the next 12 months, twice as many respondents in the Netherlands (19%) expect an improvement than a deterioration (9%) in the payment behaviour of their B2B customers. Compared to the average payment terms granted by respondents in the Netherlands (24 days), B2B customers in the construction, construction materials, metals and textiles industries were given one week longer to settle their invoices (30 days). In contrast, B2B customers in the food industry were given the shortest payment terms averaging 16 days from the invoice date. Despite the longer payment terms offered, B2B customers in the construction sector payed, on average, 30 days after the due date. Payments from the chemicals sector were not much better at 27 days past due. Payment delays were mainly caused by insufficient availability of funds (construction: 50%; chemicals: 25%) and buyers’ use of outstanding invoices as a form of financing (textiles: 41%; chemicals: 25%). Like respondents in Western Europe (58%), most respondents in the Netherlands (69%) do not expect changes in the payment behaviour of their domestic and foreign B2B customers. However, the percentage of Dutch respondents expecting a change for the better (19%) is higher than that registered at regional level (7.6%).